Two journalists in Sydney were independently sent out to cover the story of the Play Me, I’m Yours Sydney 2009. Meeting for the first time at one of the pianos they have since got married! Luke Jerram was invited to their wedding! Another couple first met at our street piano in Liverpool Street Station, London. 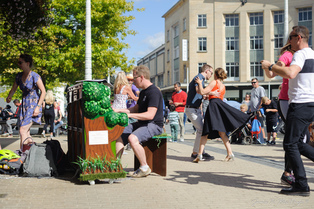 They fell in love and had the street piano at their wedding one year later! This couple in NYC decided to get married beside a street piano and this man proposed using the street piano. In April 2013 Luke met Italian pianist, Samuele Rossini, who had arrived in London with nothing, homeless and looking for work. Samuele explained how when he first arrived in London by train, there was a piano just waiting for him at St Pancras International Station. Playing each day at the station, he was spotted by a producer who commissioned his first album! Talented young pianist Paul Gbegbaje was one of the stars of Play Me, I’m Yours London 2010, wowing passers by with his incredible playing, including some of his own compositions. The City of London Festival were so impressed by his abilities that they donated the Canary Wharf street piano to him as he didn’t have one of his own to play. Since then Paul has gone on to star in the finals of Britain’s Got Talent. You can see Paul performing on one of our Street Pianos here, a year later he auditioned for Britain’s Got Talent! 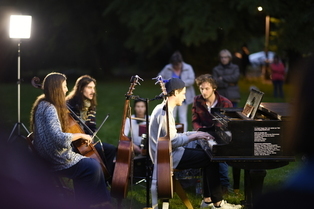 Inspired by Play Me, I’m Yours in Paris Markiyan Matse set up this Peace Piano in Kiev. – After purchasing some of Luke Jerram’s glass artworks, Elton John, generously donated a new piano to St Pancras Station in London after a surprise free pop-up concert at the station back in February 2016. – James Rhodes helped launch the art project in Leicester Square London. – John Legend and Jeff Goldblum have also played the streetpiano in St.Pancras. – Lang Lang played the street piano in Boston 2016. Several musicians have written songs about Play Me, I’m Yours. Check out these fun films by Michael Travis in London & James Manzello in New York. Play Me, I’m Yours inspired the purple pianos in an episode of the hit American TV series Glee and the storyline in the popular British TV series Nurse Jackie. 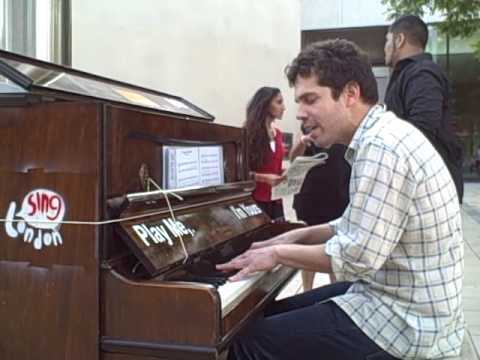 One of our Street Pianos actually features in Banksy’s film ‘Exit through the Gift Shop’! In a train station in Sao Paula, Luke came across a girl sitting at a piano with her mother in tears. It turns out the mother had worked as a cleaner for four years so her daughter could have piano lessons on the other side of town. As a piano costs a years wage they couldn’t afford their own so this was the first time the mother had ever heard her daughter play! It was a beautiful moment and a privilege to witness it. The train station loved the project so much, they pianos in all the other stations across the city. Play Me, I’m Yours in House of Lords. When the project was installed in Birmingham 2008, the city council financially supported the project, yet we were banned (for the usual health and safety reasons) from placing any piano on council owned ’public’ land. To enable the artwork to happen in London 2009, organizers had to apply for individual music licenses for each piano location. The absurdity of licensing the pianos for ‘Play Me, I’m Yours was raised by Clement Jones and discussed in the House of Lords in London on 16 June 2009. Read more about licenses in the UK here. Through campaigning (using PMIY as an example of the laws stupidity) music licensing has since changed. You no longer need a license for a street piano in the UK! For Play Me, I’m Yours in NYC 2010 it cost Sing for Hope many thousands of dollars and man hours to apply for licenses for the street pianos. It is illegal to busk in most places of the city without a license. 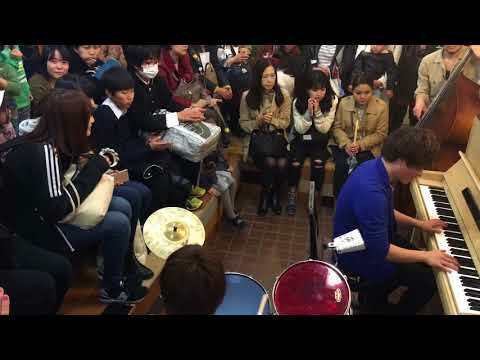 Consequently thousands of musicians poured out onto the streets to play the pianos. Some musicians simply took advantage of these licenses and played other instruments, but stood next to the piano where the permit was in place! I have been living in London for 20 years and wanted to say your ‘Play Me, I’m Yours’ project is the most successful social space experiment I have seen in all that time. The only problem is that I get a sharp twinge of sadness whenever I walk past one knowing it is not permanent. Is there no way we can find a way to keep half of these pianos available for play and maintained over summer each year? Is there a way local business could sponsor the upkeep? I’m sure there is a lot of red tape involved in keeping them in public spaces, but its quite amazing how they transform the area and indeed, introduce strangers to each other. And spread the joy of real and spontaneous music. One dark raining night in Sydney I went to see if a piano in the park had been covered. Sure enough it had, but there was a homeless man playing piano under the cover in the rain! I wished him well and left him to enjoy his moment. One day, during summer, I walk over the millennium bridge and I see someone playing a piano. He stops playing – gets up and goes away. Someone else sits and starts playing. People gather around and listen. I think – “this is brilliant”. I got the habit to go there – near millennium bridge – each night – between midnight and one. I made music – I met incredibly interesting people who stopped and listened to me playing: the reason I went at 1.00am is that people who pass by will only stop and listen if they genuinely like what are you playing. I was never used to play in front of others – before, I only played for myself – and I realized that I was missing one of the most important aspects of music. Sharing. Plus, playing in an open space is something totally different. Especially if the open space is right next to millennium bridge. The soul of the musician and the sound can expand without boundaries and he becomes free. Plus, as it is the aim of the project, people can claim back their urban space and use it to rediscover essaywriter togetherness through music. Email from a stranger in Brazil…. First off I would like to thank you for bringing your project “Play Me, I’m Yours” to my city, São Paulo. You have no idea of the positive impact it has been causing in our community. Everyday I catch the subway at Estacao da Luz, where one of your pianos is located. This is a very busy hectic place, where most of the people are coming from or going to work in a fast pace so typical of a megalopolis. It amazes me the power of the instrument, the magnetism that it generates among people. And I must say that 99% of the people who actually stop to check it out don’t have access to culture or are not used to have culture and beauty being brought to them. I believe we have to take art out of its common venues and make it more public, more accessible. 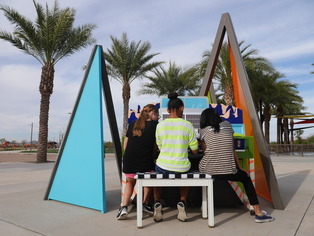 Besides bringing beauty and inspiration to people, your pianos ignite a reflection on how we use the public space, how passive or active is our relationship with the space we share . I usually wait for a co worker right next to the piano, and as she is always late, I have the chance to observe people’s reactions. I’ve seen people walking by and coming back to listen to somebody play, I’ve seen people calling dear ones from their cell phones to share the music with them, I’ve seen an ice cream vendor crying after listening to a song, I’ve seen a couple dancing, I’ve seen 2 blind guys with the subway employee ( in charge of guiding them) sitting down and taking their time to appreciate the music, I’ve seen children in total ecstasy jumping around while an old man played a famous Vivaldi piece ( from a perfume ad here in Brazil). This is the future. The democratization of art. The quality of the music is indifferent, the proposal of the installation is everything. Those beautiful pianos are self-esteem boosters for the everyday worker, who doesn’t have access to this kind of stuff not even on weekends. Pianos here are often are considered as “rich class” instruments, unlike the acoustic guitar or drums. I can feel the respect they have for the instrument, I’ve seen people caressing it gently, admiring the keys, the shape, all its contours…Thanks again! You brought slices of magic to us all!!! I heard about this story on NPR today and looked this up, and I have to say – Luke, you are an inspiration. This is true art, in that it impacts people and engages their sense of creativity. This is a lot better than plopping modern sculpture in parks all over town because it does inspire interaction. I loved hearing how the schoolchildren took to decorating the piano they came across. There is more than one way to express creativity with a piano, I guess (I’m an avid player). An ingenious idea and full credit to you, Luke, for an inspired thought brought to fruition. I would love to do this in Thailand. If only I could find enough pianos. I think it’s the nicest unusual new story for a long time. It’s good to see people caring about wanting people to play… very often when a pianist passes a pinao shop he sees them calling him… but you don’t always feel so welcome to sit and play. I like the piano shop in the film ‘Betty Blue’ The little boy prodigy that came in to practice because his parents hadn’t the money for a piano. We know about the pianists there are, and who they are. But we will never know who the great pianists were that never got to touch a piano in there lives. I’m sure there are some here in Thailand like this. I would so like to do this here… can anyone help? This is one of the simplest and yet most wonderful things I have ever seen at the Sydney Festival. Every day I teach at Victoria Park Pool, and listening to the joy a simple piano brings to so many is a clear reminder of how powerful the arts are in shaping our lives, and how much poorer we are when denied access to them. This morning a Japanese lady completed her swim, sat down and played a few simple tunes that transcended any language barriers she had. A huge man appeared about an hour later, produced several books of sheet music and provided a recital worthy of any concert hall in the land; punctuated by laughing children, splashing in the toddlers pool and the sounds of aquatic life around any swimming pool in Australia at that moment. Only the privileged 100 or so patrons who were at the pool at the time could benefit, and perhaps this was the only performance this chap had given in years. It was very much appreciated by me an my students. Yesterday my niece and nephew, Josh and Elyse came to visit me at the end of my teaching for the morning. The piano’s cry, ‘Play Me I’m Yours’ was irresistible. The intensity of the moment is captured here. Enjoy, we have and will continue to do so!